I know it’s August and I probably shouldn’t be making anything pumpkin flavored yet, but I LOVE pumpkin and LOVE fall and couldn’t wait! 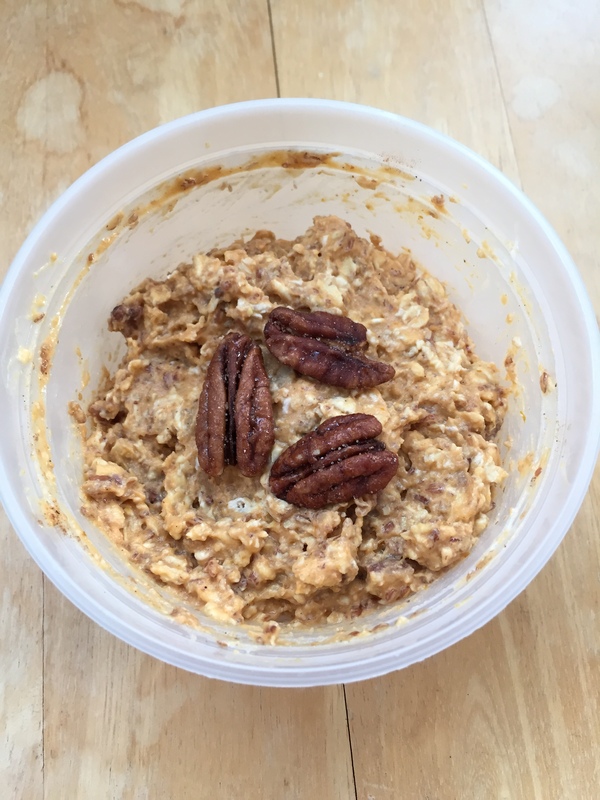 I’ve been making overnight oats a lot lately because they allow me to wake up, get dressed, and grab my breakfast on my way out the door. No cooking, toasting, or microwaving required. Since I love pumpkin I figured it would be the perfect addition to my oats. I used pure pumpkin (canned) and a healthy dose of pumpkin pie spice to up the flavor. 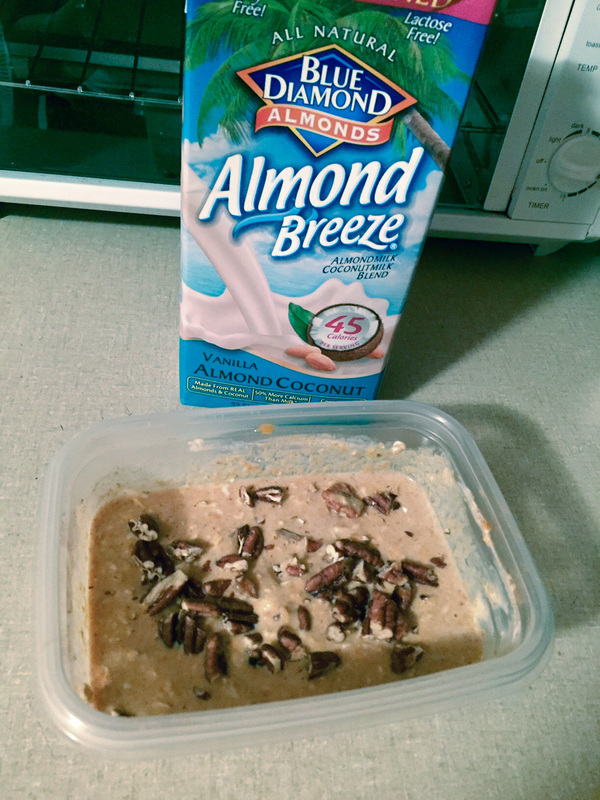 For sweetness, I used a mashed banana, a little pure maple syrup, and Almond Breeze Unsweetened Vanilla Almond Coconut Milk. No need to add sugar when you use these; they make the oats naturally sweet! 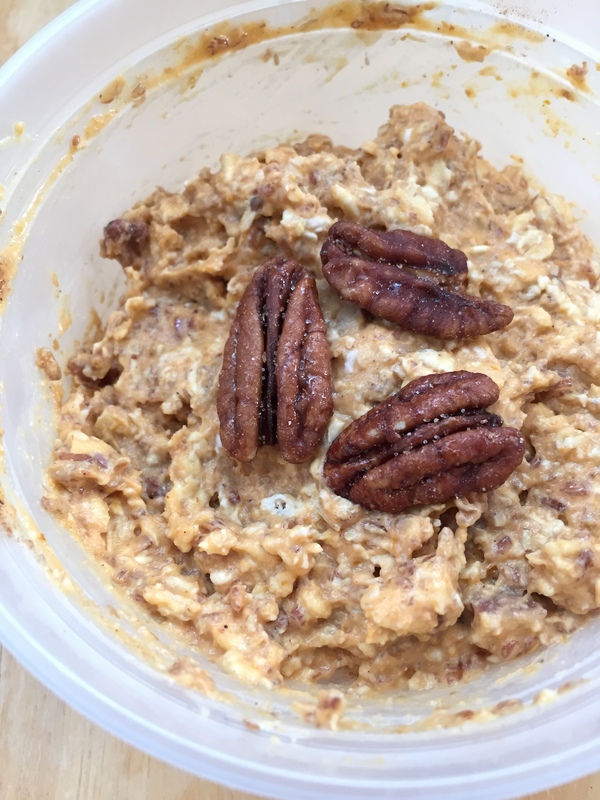 I added some raw pecan pieces for some crunch, and then topped the oats in the morning with a few candied pecans – just to make it look all fancy 🙂 Enjoy an early taste of fall with this recipe! 1.) In a small bowl or Tupperware, mash the banana. Add the rest of the ingredients, stir, and cover. It will be slightly watery, don’t panic! Place in the refrigerator overnight. 2.) In the morning, uncover the bowl, grab a spoon, and enjoy! Top with candied/whole pecans if you want it to look extra snazzy!